Sprouts, microgreens, and baby greens are very young, tender plants, used as salads or garnishes on many types of dishes. Each of the names- sprouts, microgreens, and baby greens are all considered different products, as the plant is harvested for eating at different times. They add can add color, texture, and interesting flavors to meals. 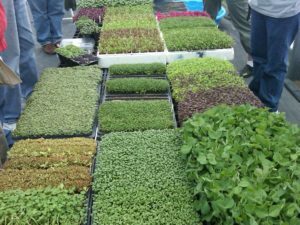 Microgreens in particular are gaining popularity among chefs and more farmers are growing them. These are easy to grow and sprouts and microgreens can be grown indoors at home. The real key with sprouts is sanitation. There is risk of contamination with Salmonella and E. coli, which is often the result of contaminated seed. Commercial sprout operations must adhere to very strict sanitation standards but there have still been several outbreaks of illness from consuming commercial sprouts. Growing them at home does not mean they are safer since seeds are often the source of infection. Therefore it is very important to purchase seeds that are sold specifically for sprouting and that have been tested for the presence of microorganisms. Keep sprouts away from other food production areas and animals, and always wash hands thoroughly before setting up your sprouting operation. Microgreens are the next size up from sprouts. The first green leaf-like structures to emerge on a seedling are called the cotyledons. The seedling has one or two cotyledons, and they are not typically the same shape as the leaves on the mature plant. The leaf-like cotyledons may also be different colors such as purple or red. Microgreens are harvested for eating when the first leaf after the cotyledons, or the first true leaf, emerges. Many edible plants make excellent microgreens, including plants whose greens are not often consumed, such as carrots. Lettuces do not make good microgreens because they are too delicate. Common choices are broccoli, dill, basil, arugula, beets, and mustards, but there are many others. They each add a unique flavor and texture to any dish. The flavors are often similar to the mature version of the plant but tend to be more subtle. Growing your own microgreens at home is easy. Microgreens are grown in soilless potting media, such as a peat moss-based mix with vermiculite or perlite. To grow your own, put potting media from ½” to 1” into a sterile tray with drainage holes. Broadcast seeds across the entire tray or plant in rows and gently press into the media. Some seeds benefit from having a thin layer of media placed on top and others do not need it. Some harder seeds, like beets, will germinate more easily if they are soaked in water before sowing. Keep the seeds moist with a misting system until they germinate. After germination, keep moisture in the media from below the tray, either with a solid tray that holds water or with a food grade burlap cloth located under the media. Avoid watering the microgreens directly because this can encourage disease to develop. Because they grow in media, do not eat the root. Instead, harvest microgreens by cutting the plant above the soil line when they are approximately 1.5-2.5” tall. Use clean scissors to cut them and gently scoop the harvested handfuls into a clean receptacle. The different plants used for microgreens vary in time from planting to harvest, but typically the process takes 7-21 days. It is easiest to sow only one cultivar in a tray but if you would like variety, consider planting cultivars that germinate and reach harvest stage in the same amount of time. Baby greens are the next size up. Plants used for baby greens are typically more familiar to us as greens- baby spinach, lettuces, kale, beet greens, and others. We only eat the leaves from baby greens and they are often used in salad or mesclun mixes. Unusual greens and herbs add different colors and flavors. Some to try might be amaranth greens or chervil. 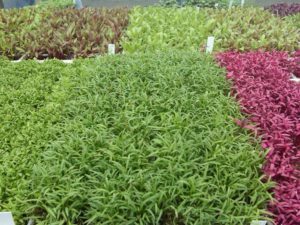 These are also relatively easy to grow, though unlike most microgreens, may require some fertilizer to reach the ideal size and quality. Next time you’re out at a restaurant or farmers’ market, look for microgreens and give them a try! If you like them, and enjoy growing things at home, consider growing a tray yourself, to add variety to winter cuisine. For more information on sprout safety and growing, see: https://www.clemson.edu/extension/food/food2market/factsheets/7-the-food-safety-of-sprouts-factsheets.html . 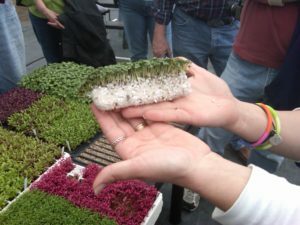 For more information on growing microgreens, see: http://gardeningsolutions.ifas.ufl.edu/plants/edibles/vegetables/microgreens.html. With any other questions about growing food at home or gardening, contact the NC Cooperative Extension-Caldwell County Center at 828-757-1290.